In November after our 20-day trek in the Khumbu/Everest region, we headed to the town of Pokhara to embark on yet another trek in the Himalaya — this time a short but strenuous 7-day trek to Annapurna Base Camp, also referred to as the ABC Trek or Annapurna Sanctuary Trek. 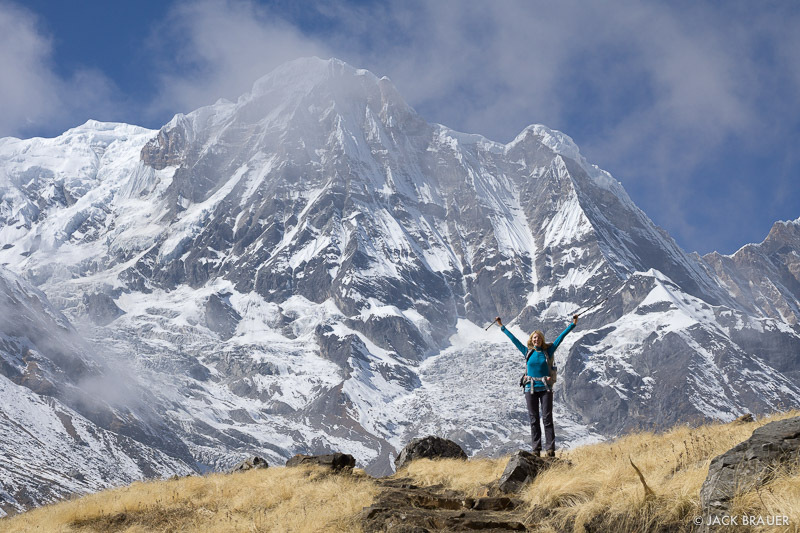 At 8091m / 26545 ft., Annapurna is the tenth highest mountain in the world. The trek to its south base camp ascends the long and jungly Modi Khola gorge, finally reaching a high basin ringed by soaring peaks including, of course, Annapurna itself. Posted in Backpacking & Trekking, Himalaya and tagged Himalaya, Nepal on January 27, 2015 January 28, 2015 by Jack Brauer. In October and November of this last year, Claudia and I fulfilled lifelong dreams to trek in the mighty Himalaya of Nepal – the world’s biggest mountains. We spent 20 days trekking the so-called “Three Pass Trek” over three high passes and through the four major valleys of the Khumbu/Everest region. Of course everybody knows about Mt. 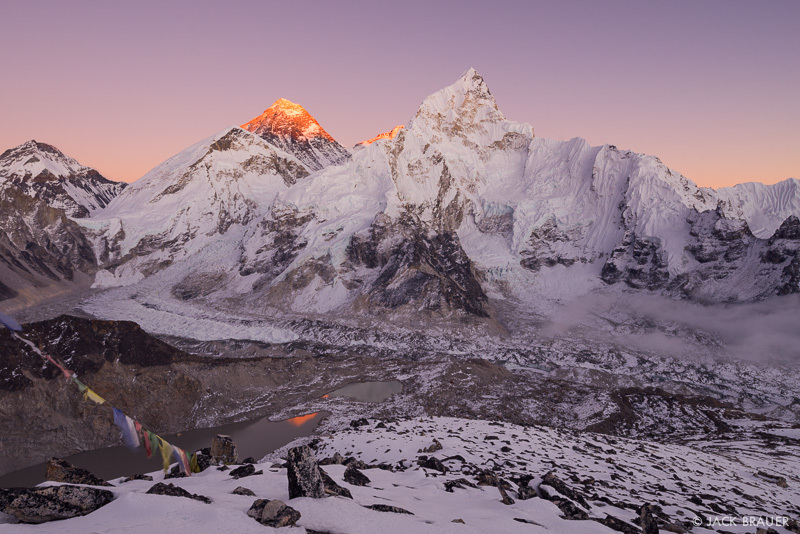 Everest, the world’s tallest mountain, but often overlooked is the fact that Everest is just one of many other enormous, spectacular mountains in this range. It’s a dream destination for mountaineers and trekkers alike. Posted in Backpacking & Trekking, Himalaya and tagged Himalaya, Nepal on January 24, 2015 October 25, 2016 by Jack Brauer. 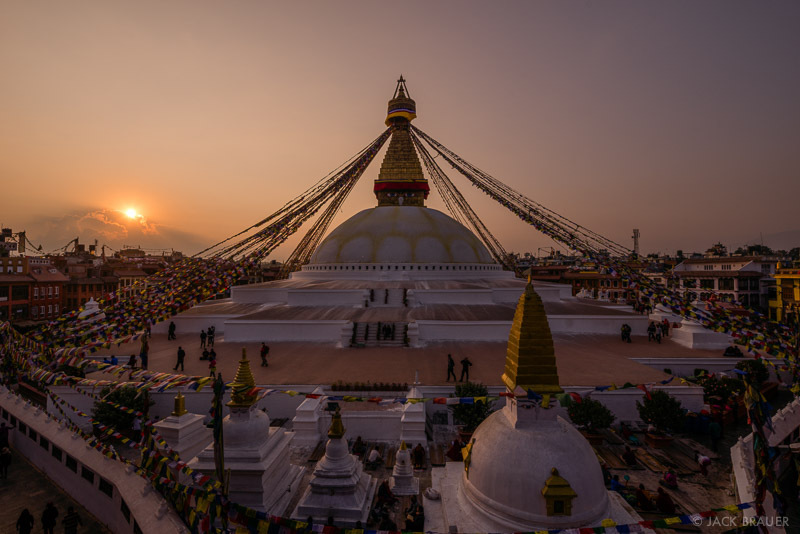 Sunset at Boudhanath, an ancient Buddhist stupa in Kathmandu. During our recent travels to Nepal, we spent some time in the capitol city of Kathmandu. Here are a few photos from this crazy and amazing city. 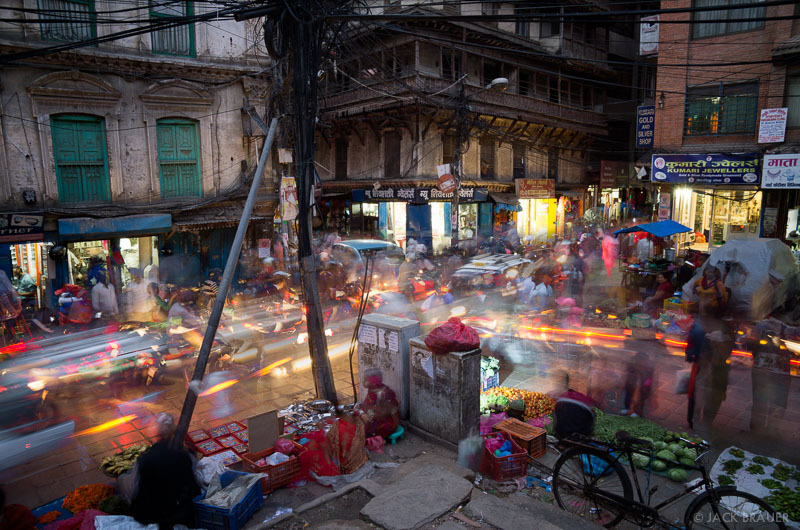 A typical chaotic intersection in Thamel, with motorcycles, cars, and crowds flowing nonstop. The most immediate observation any first-time visitor in Kathmandu notices is likely the chaotic traffic. With a complete absence of traffic lights or stop signs, cars and motorcycles and people jam the streets inches from each other in a harrowing flow of machinery. Car horns are used more frequently than blinkers. Though it seems like utter chaos at first, one soon detects a certain harmony and efficiency to the madness, like a river with thousands of chaotic particles flowing together seemingly without effort. In any case, it’s traffic on another level. 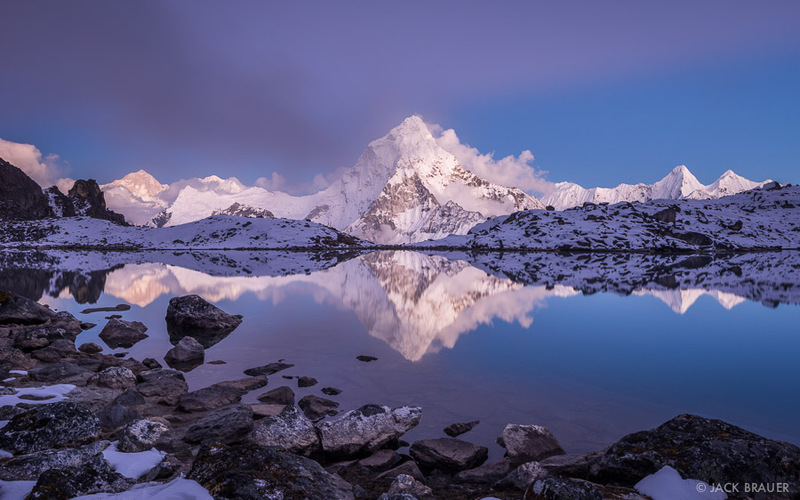 Posted in Himalaya and tagged Himalaya, Nepal on January 22, 2015 January 27, 2015 by Jack Brauer. Sunset light on Mt. Everest (8850m / 29,035 ft), the tallest mountain in the world, as seen from Kala Patthar (5540m / 18,175 ft). 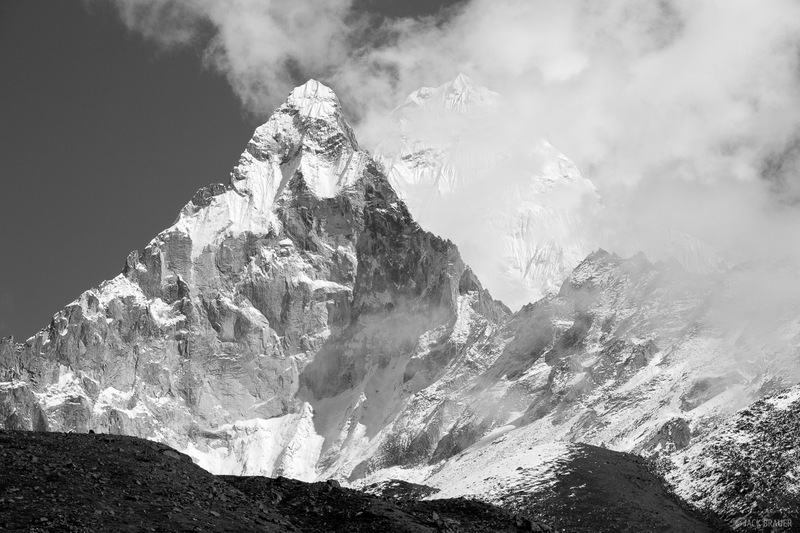 The pointy mountain in the center, which only appears bigger due to perspective, is Nuptse (7861m / 25,791 ft). 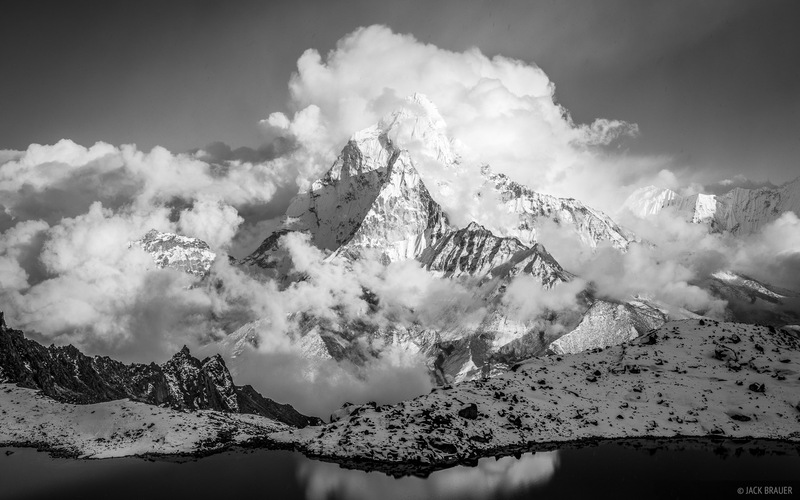 Posted in Himalaya and tagged Himalaya, Nepal on January 16, 2015 by Jack Brauer. After a grueling 36-hour series of flights, we have finally made it to the impressively chaotic city of Kathmandu, Nepal! During our approach into Kathmandu we were treated with a fantastic view of Mt. 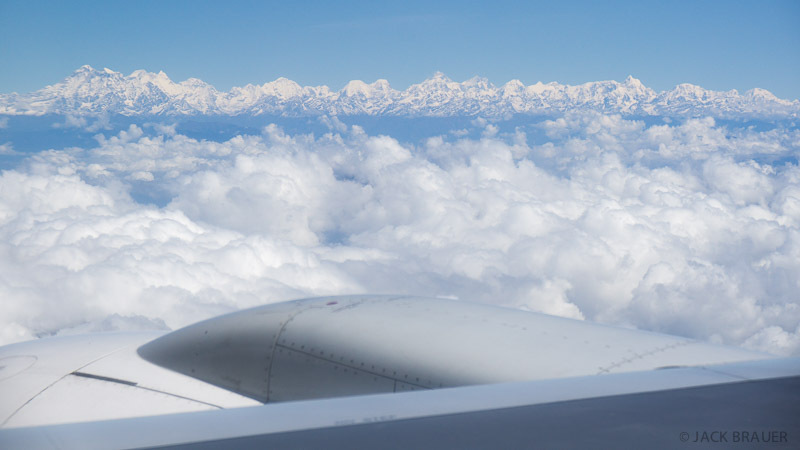 Everest and the Himalaya range smothered in what looked like a fresh coating of snow. We soon discovered that it was fresh snow indeed — and lots of it. On Tuesday a cyclone from India hit the mountains and dumped several meters of snow. 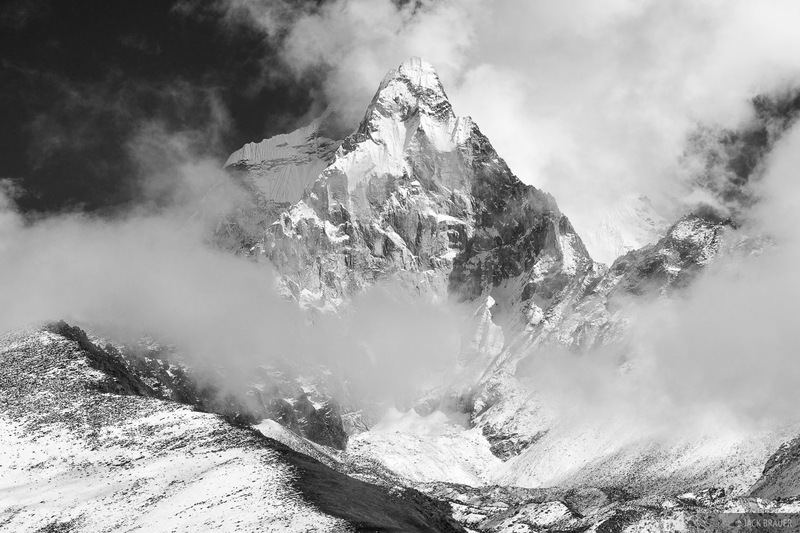 Tragically, at least 27 lives of trekkers and climbers were lost during the blizzard, mainly in the Annapurna area. 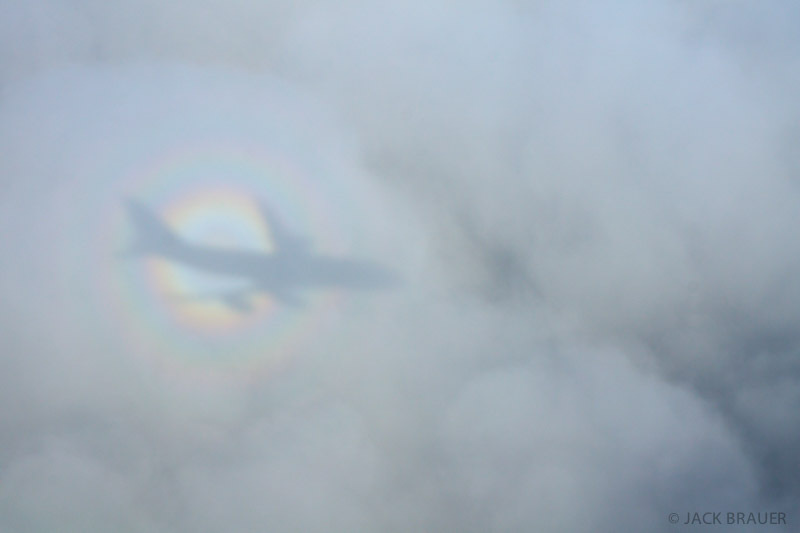 [News story here]. 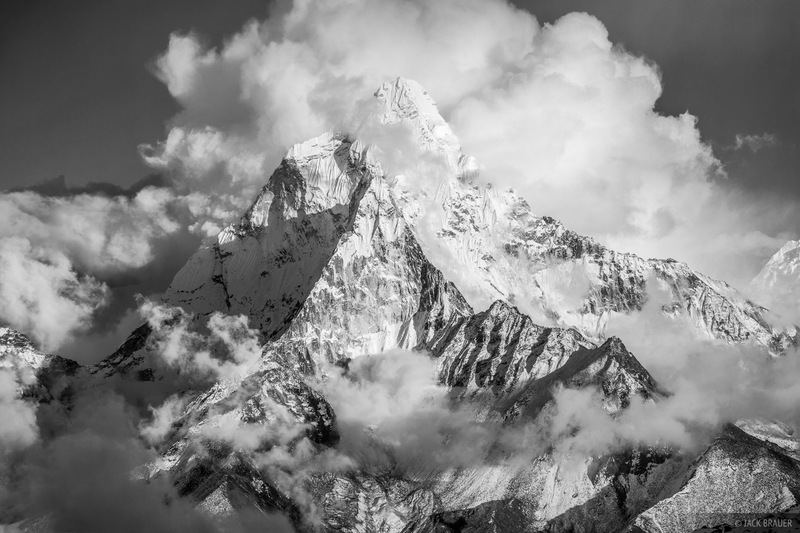 This stunning and saddening news has us wondering about our upcoming trekking plans; we will speak with those in the know to see how all this snow will affect the possibilities. But I just wanted to let you all know that we are safe, and will play it safe while we are in the mountains. Our hearts go out to those who were lost in the mountains, and their friends and families. 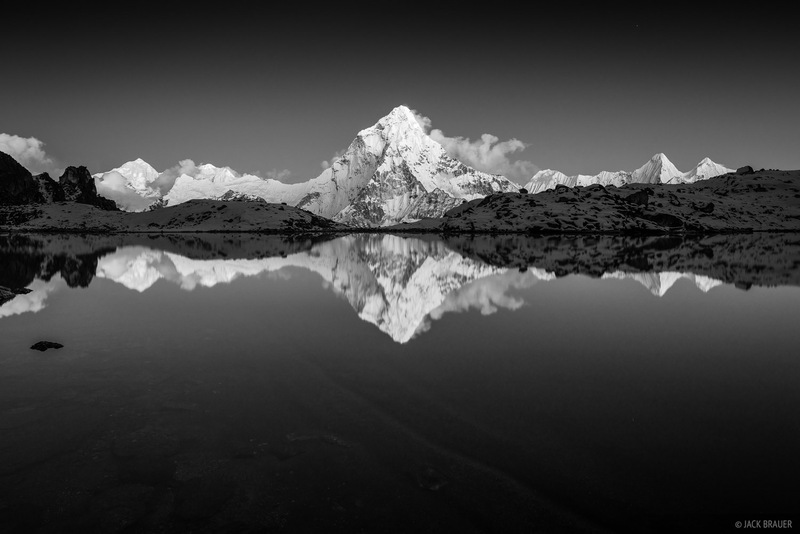 Posted in Himalaya and tagged Himalaya, Nepal on October 16, 2014 by Jack Brauer. 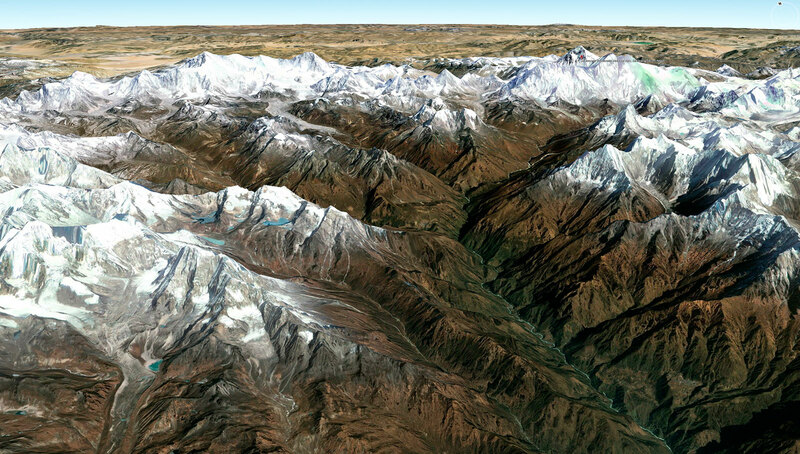 A Google Earth aerial view of the Khumbu region of Nepal. Mount Everest (29035 ft / 8850 m) is the mountain at top right. Everest gets the spotlight as the tallest mountain in the world, but it is surrounded by a plethora of equally impressive peaks. For a sense of the enormous scale of these mountains, consider that the prominent valley in the center is over 12,000 vertical feet deep! 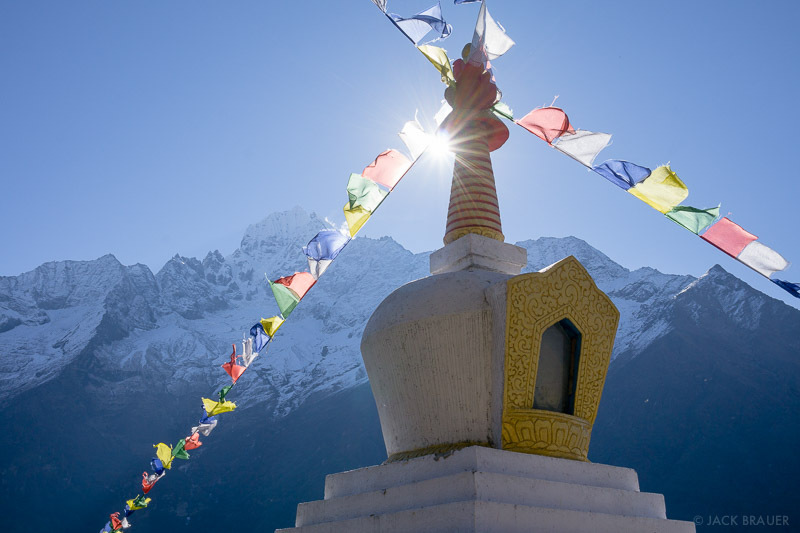 Tomorrow we fly around the world to Kathmandu, Nepal to spend two months trekking in the Himalaya – the world’s tallest and grandest mountains! We plan on hiking in the Khumbu/Everest region during the first month, staying in teahouses in the small villages along the way. (No, we won’t be climbing Everest). Our plans are open for the second month, so we’ll just play it by ear. I am so excited for this trip I can hardly cope! Although I will mostly be unplugged during our adventures in the mountains, I am still accepting print orders through my gallery website. Prints ordered in October, November, and December will be delivered according this print delivery schedule. The deadline for ordering prints for Christmas gifts is November 21. I will respond to image licensing requests and other inquiries as quickly as I am able to. 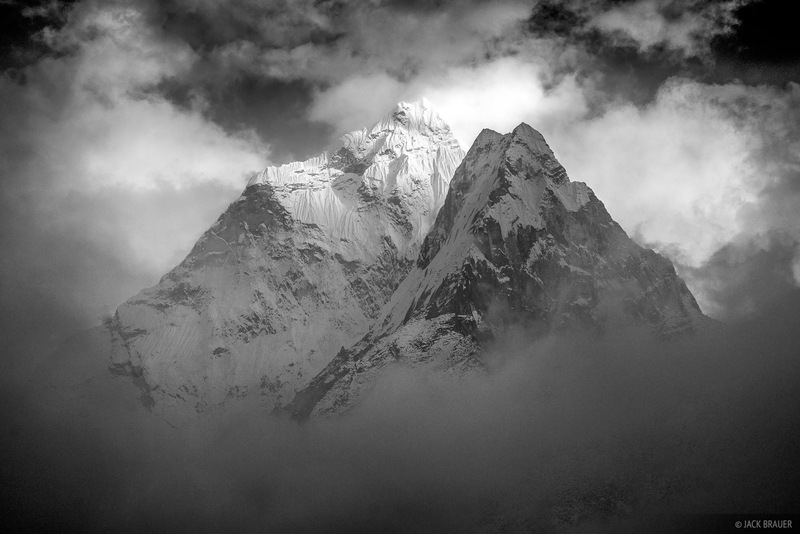 Posted in Himalaya and tagged Himalaya, Nepal on October 13, 2014 October 16, 2014 by Jack Brauer.